I was out of town this weekend, but when we arrived home last night, there was a package waiting for me- my first Kickstarter had arrived! I wasn't expecting them for about another week, but I am so happy they're here. 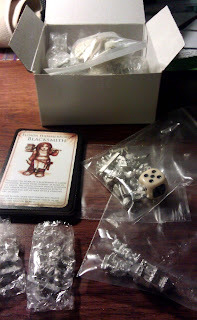 The Kickstarter was done by Stonehaven Miniatures and it was a set of Dwarven Adventurers. I bought the whole set, which includes 20 figures, accessory bits, character cards, resin bases, and a nice die with their logo on it. I also threw in for the shirt they offered. It was only $10 and has a fabulous print of the art for the Fallen King on it. The package shipped just on time, so I am very pleased with this Kickstarter. The miniatures are just fantastic. The have great detail and lots of personality. They also have several that you don't see too often- like a Necromancer, a Monk, and a Brewmaster. A full third of the characters are also female, which is nice to see. My favorite might be the Highwayman, the pose is really dynamic, or the Druid with her familiar. Both are really fabulous. Unfortunately, they sent me two of the Rogue and no Blacksmith. But I contacted them about the mix up, they responded very promptly and a Blacksmith is now on her way to me. It was a very pleasant customer service experience. I can completely understand how that might happen when they're trying to fill over 1400 Kickstarter orders on time. I'm not wild about the bases they came with, but I didn't intend on using them anyway. I'm going to select one of the models (not sure which one yet) for an upcoming RPG character, so I'll probably base them all a little more special than I would for Warhammer. Stonehaven Miniatures is doing another Kickstarter soon, for Gnomes and Halflings. I probably won't jump in on that one because I have too many other hobby projects on the table right now. But I'm sure they will be just as awesome as these. My only regret with this one is that I didn't order the Troll that was optional. I wish I had, it's really cool.